The following figures show the annual average temperature anomalies for Reykjavik and Akureyri – the only long-term stations in Iceland (plotted at http://www.appinsys.com/GlobalWarming/climate.aspx). 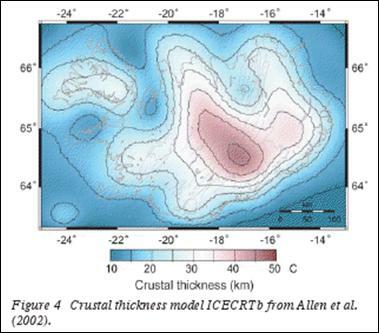 The blue line shows the NOAA GHCN data; the red line shows the Hadley/UEA CRU (CRUTEM3) data. 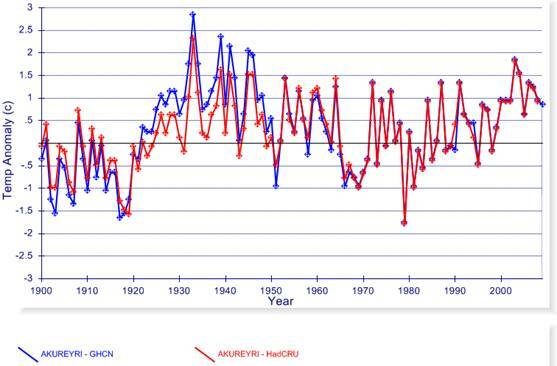 The main difference between GHCN and HadCRU is that the CRU has adjusted the data to slightly reduce the 1930s warming (which exceeds the 1990s warming). There has been no net warming over the last 80 years. 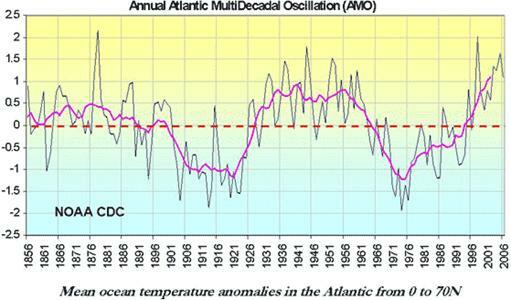 The AMO affects regional temperatures in the Arctic area of the northern Atlantic. The following figure shows the temperature anomalies for Reykjavik and Akureyri (from the NOAA GHCN database). The next figure compares the temperature data with the AMO shown previously. There is a strong correlation between the two. 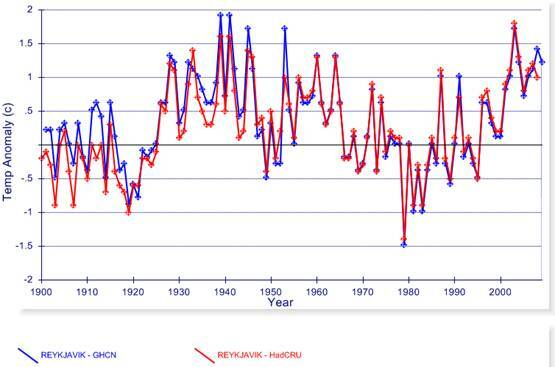 This shows that CO2 is not driving temperatures in Iceland, since the AMO is calculated from de-trended ocean data. See: http://www.appinsys.com/GlobalWarming/AMO.htm for more info on the AMO. 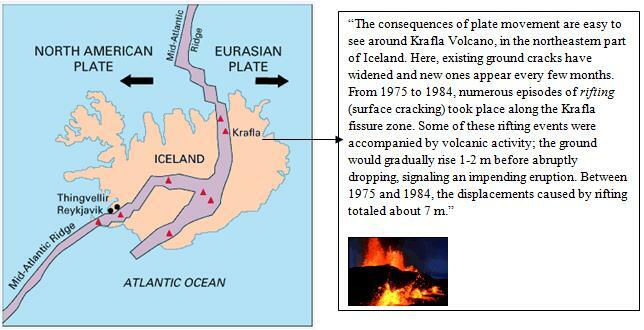 Iceland straddles the Mid-Atlantic Ridge where the North American and the Eurasian Plates are separating: “Iceland is splitting along the spreading center between the North American and Eurasian Plates, as North America moves westward relative to Eurasia.” [http://pubs.usgs.gov/gip/dynamic/understanding.html] The following figure from this source shows active volcanoes (red triangles). 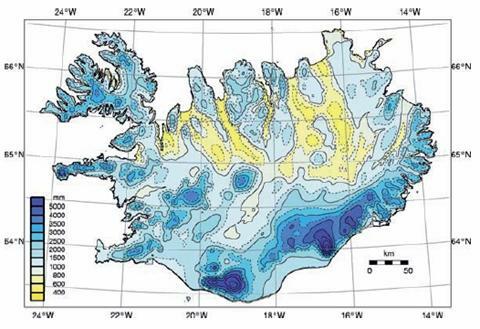 Also from the above source: “The regional distribution of glaciers in Iceland indicates how precipitation arrives with prevailing southerly winds. … the largest icecaps are situated in the southern and central highlands. On top of the larger icecaps, average temperatures are below or close to freezing throughout the year, with most of the precipitation falling as snow.” The following figure shows annual precipitation. The stupidity of these people (as reported at the alarmist “Scientific” American) – a glacier sitting on top of the Mid-Atlantic Ridge in the most volcanically active area of the world will cause more volcanic eruptions from melting due to human CO2 caused warming – when it was just as warm before the Little Ice Age, and warmer in the 1930s! The area is a volcanic hotspot with constant upwelling of magma! The BBC reports: “Offshore volcanic activity has resulted in the formation of separate volcanic islands, one of which, Surtsey, appeared as recently as 1963.” [http://news.bbc.co.uk/2/hi/europe/8623239.stm] Obviously active volcanoes often cause uplifting – but the “scientists” in the SA article above attribute it to a melting icecap due to global warming. 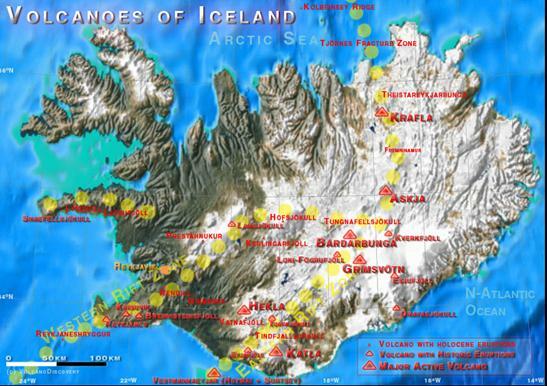 Scientific American (above): “possible links between global warming and Icelandic volcanoes. 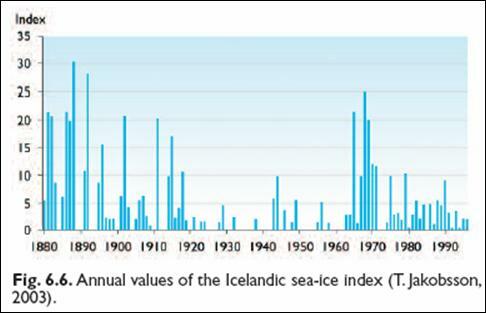 That report said that about 10 percent of Iceland's biggest ice cap, Vatnajokull, has melted since 1890”. 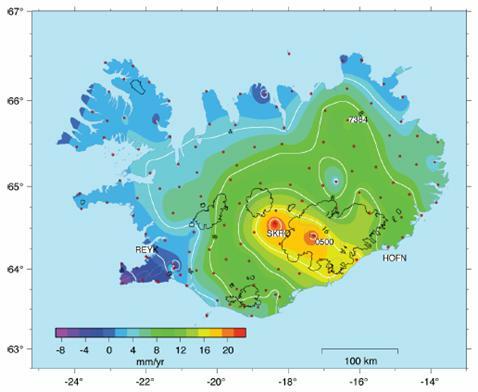 NYTimes [http://www.nytimes.com/2006/01/17/science/17icel.html] “In 1996, an eruption beneath the Vatnajokull ice cap, Europe's largest ice mass, led to a jokulhlaup that forced sediment, meltwater and ice out along the 12-mile stretch of the glacier's edge. 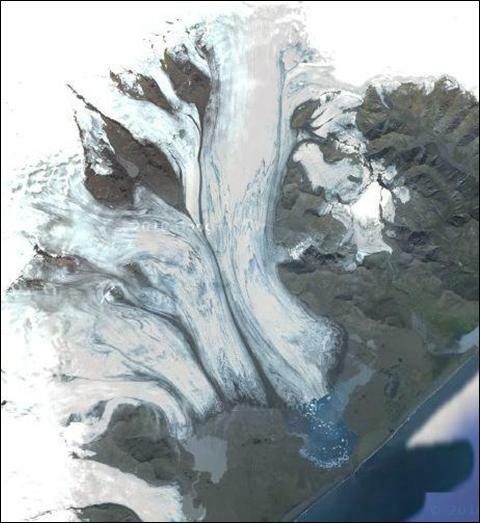 The flow of water out of the glacier created a river to rival the Amazon in size, at least for a few minutes.” Global warming? More likely the volcanoes. 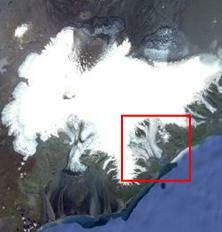 Notice the areas of maximum uplift – on the Grimsvotn volcano beneath the Vatnajokull glacier, and between the glaciated areas – still volcanically active. This is how confused the alarmists are. It is physically impossible for it to “break apart and slide into the Atlantic” – it melts and the tip breaks into icebergs in the lake formed at the terminus. Europe’s largest glacier is the Vatnajokull ice cap, not the Breidamerkurjokull which is the largest outlet glacier from Vatnajokull. 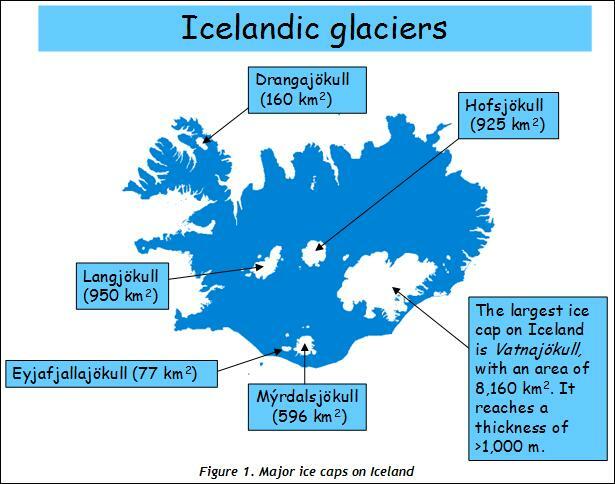 (Breidamerkurjokull has been receding since 1903 when observations were first recorded, as documented previously). 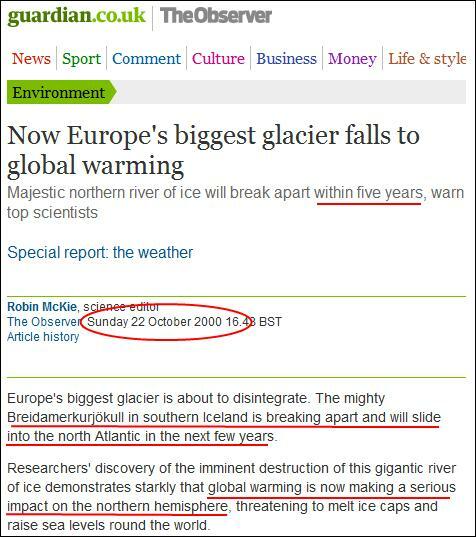 The Guardian, by phrasing it this way “Europe’s biggest glacier is about to disintegrate”, is telling a lie to promote the bogus scare. 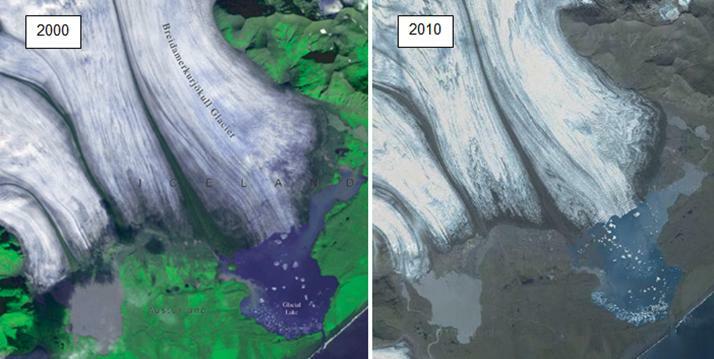 The following compares the 2000 view from above-right (UNEP) with the 2010 view (Google maps). 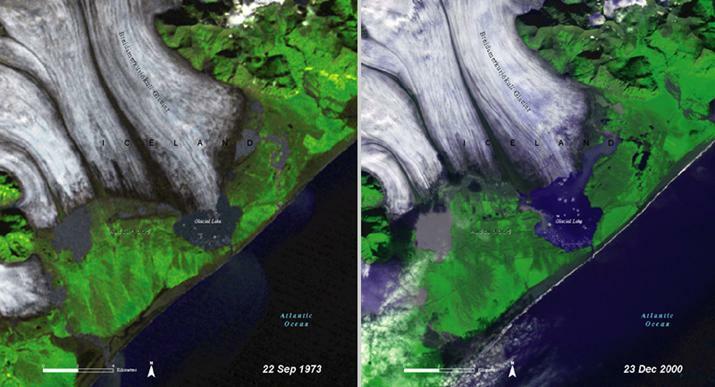 The UNEP article states: “During much of the 20th century, Iceland's Breidamerkurjökull Glacier has been shrinking. It has been studied extensively since 1903, when researchers drew up detailed maps which showed that its base is just a few hundred metres from the ocean edge. 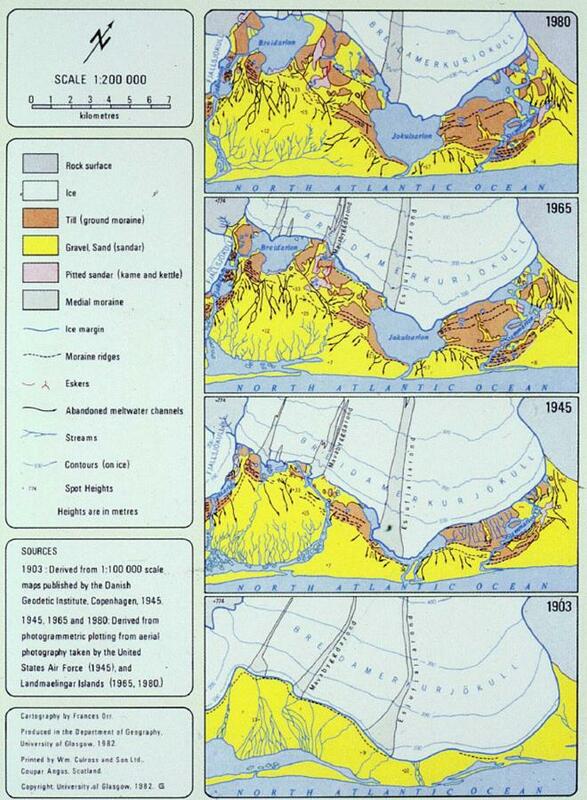 Over time, the glacier has receded so that its base is now several kilometers from the coast. 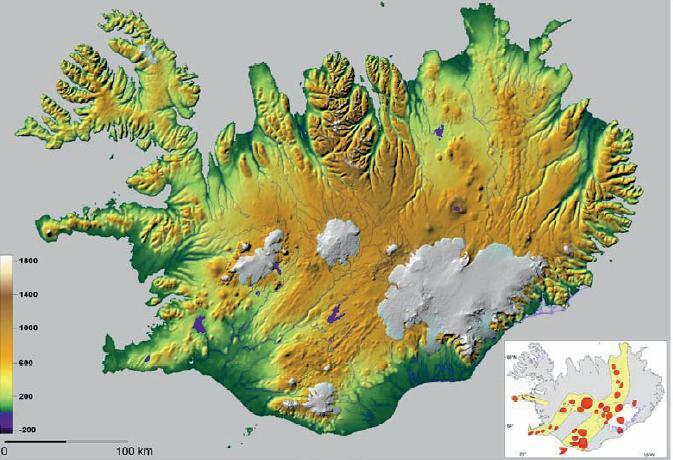 As the huge river of ice pulled back across the Icelandic landscape, thousands of hectares of fertile farmland have been exposed, and people are populating the area that was until recently buried under tonnes of ice.” Sounds like good news – more useable land.